Tandarra offers a range of stock stacking systems, aswell as designing and manufacturing tailored systems to suit your specific product requirements. Below are a couple of our stock product stacking options. Dropstacker – Our pneumatic dropstacker is available in 6m lengths and is manufactured to suit either right to left or left to right running machines. Festo air-cylinders take care of the opening and closing of the stacker doors, with the trigger mechanism linked into the controller on the rollformer so that the doors open shortly after each cycle of the roll-formers guillotine. 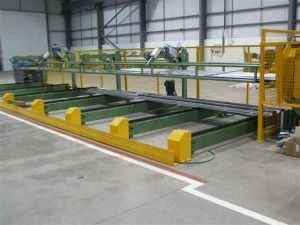 There are multiple variations to this standard system available including an electric Bonfigioli driven, height adjustable format for use in conjunction with our double deck machines, and a "flip top" format that moves the stacker arms out of the way for easier crane removal of completed bundles. Lowerator – Tandarra’s lowerator system is designed to work in conjunction with profiles such as Bondek and Purlin sections that are stacked inside one another. As the operator slides the bottom sheet onto the lowerator, it will automatically drop in height relative to that of the profile being stacked, so that the following sheet can be easily flipped and placed on top. 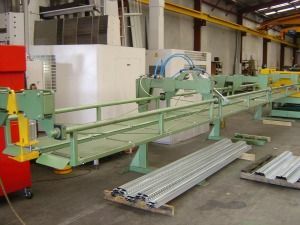 This process continues until an entire bundle has been achieved, at which point the pack will be driven away on a conveyor for removal, and the lowerator returned the start position, ready for the next bundle to be stacked. 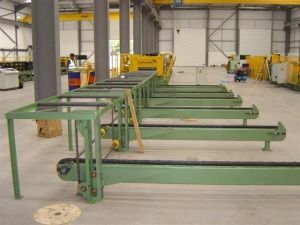 Conveyors – Predominantly used in conjunction with a dropstacker or lowerator, our chain conveyors will automatically drive a completed bundle away for banding and removal, whilst allowing the next bundle to continue being stacked. This product is a must for continuous flow on large jobs, and helps promote limited roll-former downtime. Click here to make a Stacker enquiry.